Thanks to innovative design, the WS-25 wire saw is first wire saw that can cut with free abrasive method as well as with diamond dotted wire. 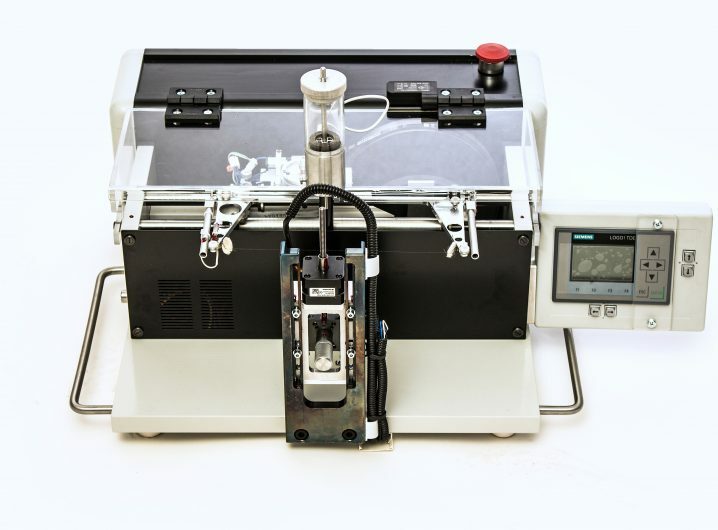 The WS-25 wire saw is fitted with an adjustable sample support with electronic vertical axis. The sample is automatically moved up during the cutting process. The wire frame stays at the same vertical position throughout the entire process. The vertical axis has 3 electronic adjustments: manual, coarse, and fine. 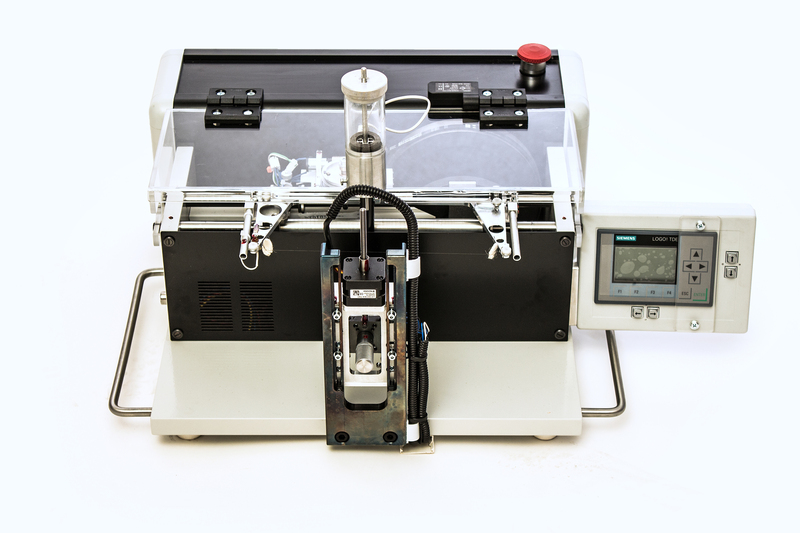 The manual adjustment is used to set cutting range according to sample size and mounted equipment. Fine regulation is used to precisely set sample position before cutting. The WS-25 wire saw has been developed to meet two important requirements: 1) cutting should not introduce deformations or defects, and 2) loss of material should be minimized. These two requirements have been met by the development of an improved cutting technique which utilizes the precision guidance of the wire and uniform application of an abrasive slurry. The WS-25 wire saw is a semi-automatic machine and requires no supervision during its operation. The wire saw can be used for precision cutting of semiconductors, ferrites, metals, and glasses, as well as many other hard or brittle solids. 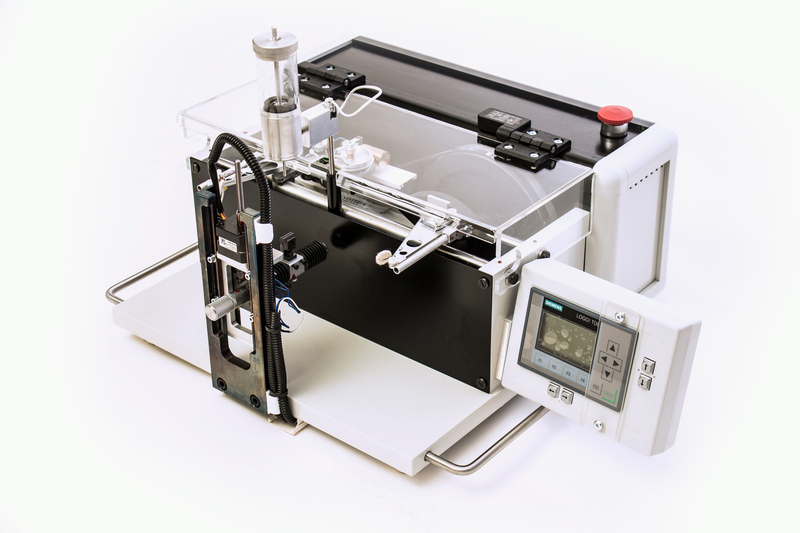 The WS-25 wire saw enables cutting of very thin slices (down to a thickness of 10μm) with smooth cut surfaces (where surface roughness does not exceed 1µm). The WS-25 wire saw is particularly recommended for cutting materials where minimization of material and surface loss demands are important. Using the thinnest available wire (20μm diameter) and proper abrasive powder dimensions, the material loss does not exceed 30 μm. Obtained slices are perfectly parallel, thus additional lapping is unnecessary. Cutting at any desired angle is possible due to the rotation of the sample holder. Use of the special accessories (goniometers, orientation devices, etc.) 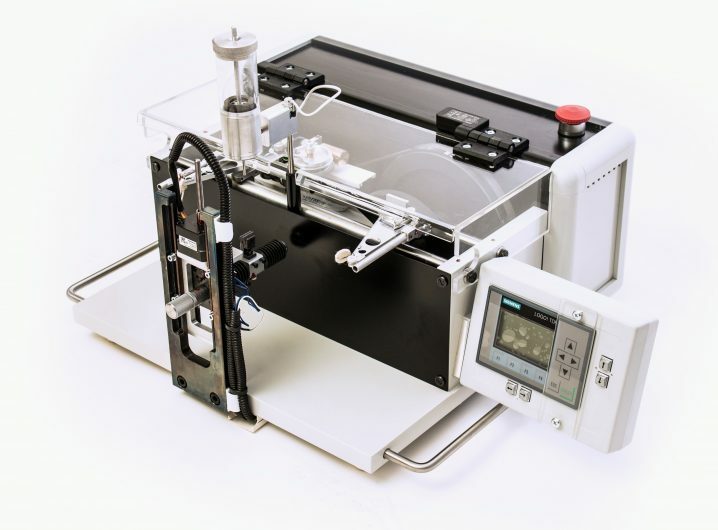 extends the WS-25 wire saw's application in precision cutting of crystallographically oriented crystals. Cutting speed depends mainly on the wire load, sample hardness, sample shape and materials (for such materials as Ge, InSb, HgTe, and GaS, cutting speed is approximately from 1cm2/h up to 3cm2/h. The WS-25 wire saw is equipped with a high precision horizontal sample carriage mechanism. Displacement of the sample by 30mm with a deviation of less than 0.002mm is possible. Sample holder can rotate around the vertical axis and be fixed in any desired position. The WS-25 wire saw is equipped with an automatic shut-off (AUTO-STOP) which turns off the saw when the cutting wire is torn, the cutting is completed, or the desired cutting depth is achieved. This wire saw is also equipped with a magnetically driven mixing device which batches the slurry. The mixing and batching procedure is automatically controlled by an electronic system, which enables adjustment of dropping frequency and drop formation time (dependent on the viscosity and density of the slurry). Electronically controlled support allows precise vertical positioning of the sample during and before cutting. The WS-25 wire saw is also fitted with safety switches which turn the saw off when the cover is opened.